Chill-Its® Evaporative Cooling Towels and Bands Provide Heat Relief For Extreme Heat Environments Including Agricultural, Construction, Industrial And More. Allegro Cooling Neck Ties Are Used For Applications Including Construction, Maintenance, Manufacturing, And More. 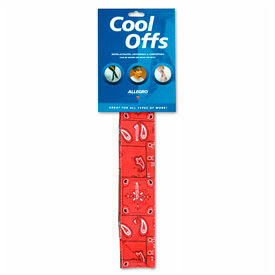 Allegro cooling neck ties are made of cotton for long lasting durability and dependability. Ties provide user comfort and protection for extreme temperature applications. Units are quilted into four sections for even hydration distribution. Cold water activated for hours of comfort. May be tied around neck or worn as headband for cooling versatility. Button hole closure ensures secure fit and stability. Package quantity is 1. Colors are Cowboy Bandana Blue, Cowboy Bandana Red, Digital Camouflage, Orange, Royal Blue, and US Flag. Dimensions are 9"L x 7"W x 7"H.
Occunomix Cooling Neck Ties & Bandanas Help Keep Workers Cool In Extreme Heat. Occunomix Cooling Neck Ties & Bandanas are lightweight and super absorbent to provide hours of cooling. Neck ties and bandanas are anti-mold treated. 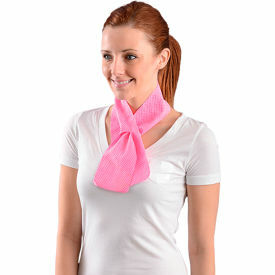 Multi-functional design for wearing on the neck, or to use to wipe down. Reusable and easy to recharge and helps reduce heat stress. Machine washable. 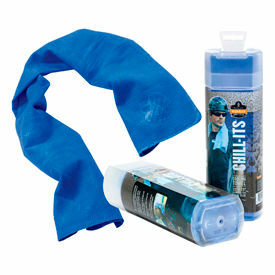 Styles include Cooling Collar Bandana, Neck Wrap, Towel, and Bandana. Available colors include blue, pink, orange, khaki, navy. green, white, and assorted. Measurements vary per style. Chill-Its® Absorptive Series Cooling Wristbands Are Used For Absorbing Perspiration To Maintain Comfort While Working In Extreme Heat. Chill-Its® Absorptive Cooling Products wick away perspiration and moisture. 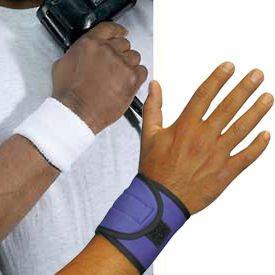 Wrist Sweatbands are made with a thick terry fabric with elastic for a snug fit. Available in black or white.